PowerTrap mechanical pumps will drain steam applications under changing pressure conditions, even in the case of vacuum formation in the vapor space. The “flooding” of heat exchangers, water hammer, corrosion problems and temperature fluctuations are thus avoided. 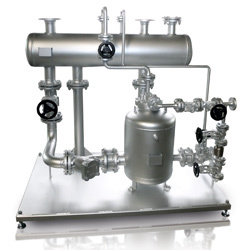 Connection-ready skids are manufactured according to customer requirements and remove condensate while maximizing efficiency and safety conditions.